Eating al fresco is, for me, one of the most enjoyable things to do when the sun is shining, sharing food and wine with family and good friends. 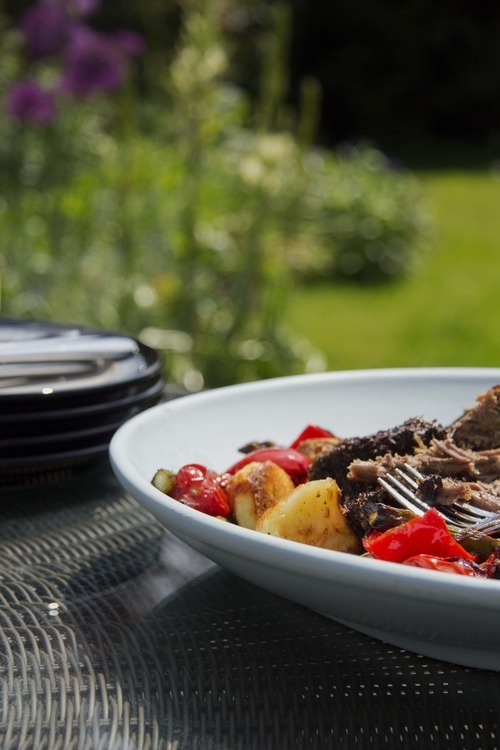 Particularly special after the long grey winter months that we have in England, and one thing that really gets me in the summery mood is fragrant roast lamb. I think it stems from holidays in Greece, exploring the wonderful landscape, fragrant with the scent of oregano, the warmth of the sun on your back. As much as I love cooking, I don’t want to spend a sunny day in the kitchen preparing Sunday lunch, so I either barbecue the lamb or cook it slowly in the in the oven. Crispy roast potatoes and roast vegetables make the perfect accompaniment, and add beautiful Mediterranean colours to your plate. Place all of the rub ingredients except the oil butter in a mini processor and blend; gradually add the oil until you have a thick paste. (If you don’t have a mini processor, you can use a pestle and mortar, crushing the garlic and salt together and then adding the herbs and spices and then the oil as before). Place the lamb in a roasting tin and rub all over with the spice mix. Take the lamb out of the oven (make sure you close the oven door, to keep it at a constant temperature) and add the water to the roasting tin, and then baste the lamb with it. Roast for 3 hours, basting every hour. If the liquid evaporates too much, just add some more. After 3 hours are up, remove the roasting tray from the oven, and rest for 10 minutes. Bring a large pan of potatoes to the boil and then cook until a fork will scratch the surface of the potatoes and make ridges. Meanwhile heat the olive oil in a small pan. Drain the potatoes and shake in the pan or in a colander until the edges are ‘roughed up’. Drizzle the oil onto the potatoes and toss them a little. Spiced Sea Salt or salt and pepper. Toss all of the vegetables and garlic in olive oil and place in a roasting tin. Sprinkle OLD BAY® with Lemon & Herb Seasoning, or salt and pepper. Add the lemon quarters to the tin and bake for 30 minutes at 200C until soft and blackened around the edges. 1pm Remove everything from the oven and serve on a platter. 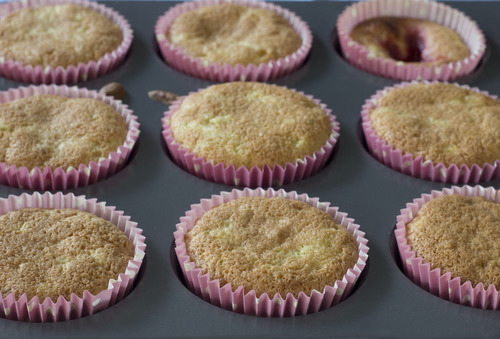 Making gluten free cakes can have varied results, sometimes they can be grainy due to the texture of some gluten free flours or they can be quite dense due to the lack of elasticity and rise, which is usually provided by gluten. There is a book of recipes that produces consistently delicious results, Red Velvet & Chocolate Heartache, by Harry Eastwood. I needed to make some cupcakes this week for a shoot and found this recipe. The unusual feature of Red Velvet & Chocolate Heartache recipes is that they all contain vegetables. Yes I did say VEGETABLES! They add moistness to the cakes that I haven’t tasted in a while, well since I became gluten free, and I LOVE cake! I’ve been known to sprint a steep hill if there is a possibility of cake at the top (okay, a bit of an exaggeration, but you get the picture!). But don’t believe anyone (you know who you are!) who tells you that there is a café at the top of Pen Y Fan in the Brecon Beacons, because there really isn’t! Using a hand whisk, whisk the eggs and sugar together for 4 minutes until they are pale and fluffy. Add the courgette and vanilla extract, and whisk until well mixed. Whisk in the flour, ground almonds, baking powder and salt until completely combined. Spoon some mixture into the paper cases and then add a teaspoon of jam into each one. You can see in this photo, that is exactly what happened to one of these cakes- it tasted just as nice! Place in the centre of the oven for 20 minutes until risen and pale brown on top. Once they are cooked, cool them in the tin for 10 minutes before placing them in the fridge for a further 20 minutes until completely cold. Beat the butter with 50g of the icing sugar, by hand in a large mixing bowl, using the back of a wooden spoon. 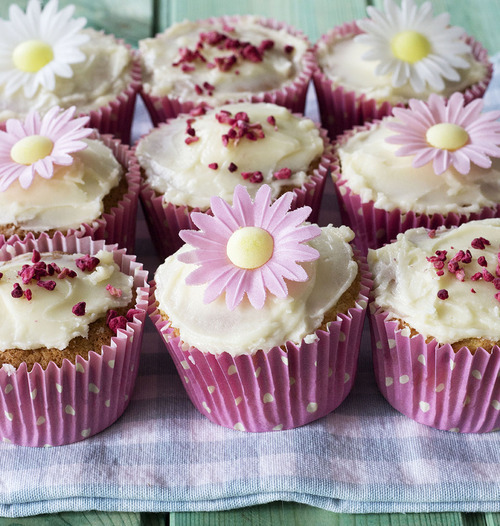 Go gently as icing sugar does have a tendency the blow everywhere if you’re over vigorous! Keep mixing until it forms a paste. Be patient- it does work! Repeat the process with another 50g icing sugar and the mascarpone. finally add the last 50g icing sugar, which will correct any ‘curdling’ that may have happened. 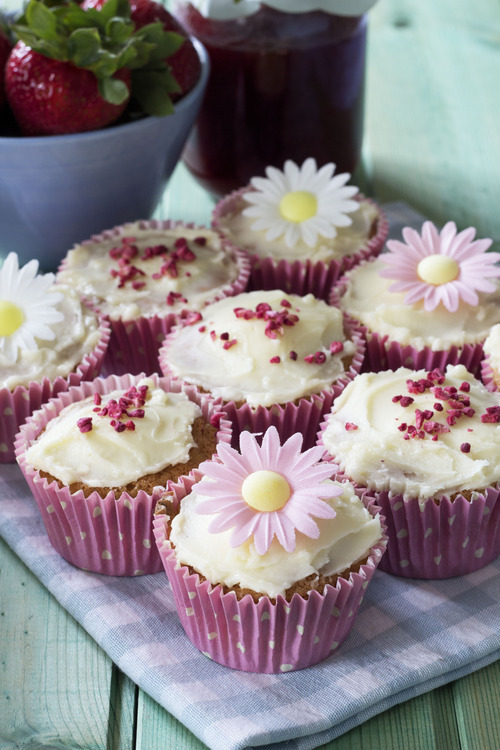 Pop the mixture into the fridge until the cakes are ready to be iced. Remember that they have to be totally cold. Wet a knife and spread the icing on top of the cakes one by one. (You will need to keep wetting you knife, so keep a cup of water close by). Top with a strawberry or any other decoration you fancy (I used rice flowers and dried raspberry flakes on these). They can be kept in an airtight container in the fridge for up to 2 days, taking them out 30 minutes before serving.